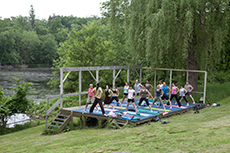 A variety of yoga classes are offered daily for all levels of students. 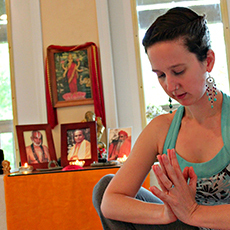 Classes are taught according to several yogic styles (vinyāsa, ashtānga, restorative, yin, nidrā) incorporating traditional postures (āsanas), breathing exercises (prāṇāyāma), deep relaxation and meditation. Classes are designed to balance the entire energy system, help to relieve stress, bring strength and flexibility to the body and establish steadiness of mind. Chi Kung, also called the Yoga of Bodhidharma, is widely regarded as the source of internal martial arts. The Buddhist sage Bodhidharma established the Shaolin Temple in China in the sixth century. His principles of yoga and pranayama are explained and practiced here in a nurturing and expansive environment of self discovery. Followed by Tai Chi Kung Fu, 11:00-12:00, Tuition $15.